A survey of over 200 law firm graduate recruitment and legal educators reveals what skills and traits firms are looking for more of in their prospective trainees: and the results will surprise you. The survey, conducted by BPP University Law School during one of the sessions at Legal Cheek‘s recent Future of Legal Education and Training Conference, reveals that it is “resilience and flexibility” which firms are seeking out, with over 60% of respondents citing this as a top-three skills requirement for the job. “Written communication” and “commerciality” also secured top three positions, with 43% and 42% respectively. The much-talked-about “tech and digital skills” came in fifth (31%), just behind “time management” in fourth (32%). Even more intriguing is that the survey also found that there are a number of what might be called more human traits which are seen as “vital” on top of the core skills: these include “emotional intelligence”, a good “attitude” and the ability to take personal responsibility for things. Not only were these elements cited more often than typical lawyer traits such as “attention to detail” and “analytical skills”, but also more often than business-related skills such as “project management”, “entrepreneurship” and “networking”. For associate roles, respondents were asked what skills were lacking in most associates: their responses were varied but one skill which came up quite often was “leadership”. Also cited were: “adaptability”, “the ability to delegate”, “creativity”, “open-mindedness” and “innovation”. The findings — from a vote taken in the session on skills for the next generation of lawyers — involved specialists in graduate recruitment and legal education participating in the conference. The session included Mark Collins, legal project management lead at Herbert Smith Freehills, and Jo-Anne Pugh, strategic director of programme design and development at BPP University. BPP are set to release a second report this month following their initial Solicitors Qualifying Exam (SQE) survey in November last year. The follow-on report will give insights from the law firm focus groups held by BPP on what skills new entrants to the legal profession need over and above those required from the narrow focus of the regulator-backed super-exam. “Resilient and flexible” – we want young men and women who will put up with our wild mood swings, dumping work on their desks as we go out to lunch or run off for an earlier train, our incredibly unrealistic deadlines (that even the clients don’t want) and slowly losing their circle of friends from university due to constant cancelling of social events. It’s amazing to re-read these grad rec articles once you’re trapped on the inside! 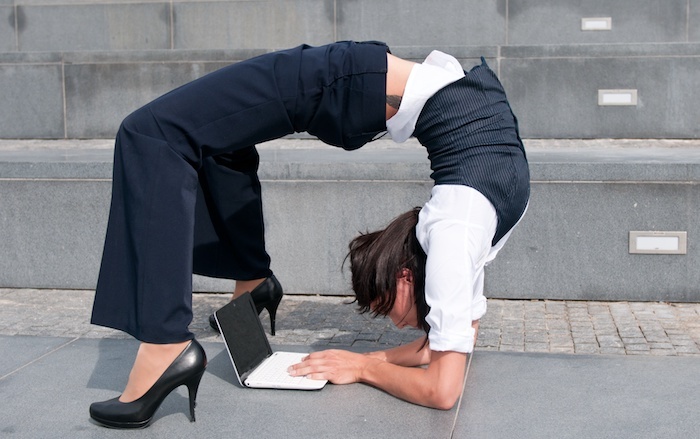 I do mean literally flexible when I put that in our grad recruitment material. Well said! But remember that this flexibility also applies to us, senior members too! For example, I’ve tried extremely hard to make my one-eyed bandit particularly flexible to handle all the incoming summer vac scheme students. Most fun I’ve had in years! It’s all about flexibility brah. Well, I think we have found our slogan for the next round of careers fairs. Expect your “It’s all about flexibility brah.” mugs and t-shirts to be coming to a campus near you next semester. Also “don’t come with a genuine interest in a specific area of law because we will stick you on whatever matters are convenient for us and expect you to qualify where you’re told”. I don’t think law firms are looking for talent, flexibility, resilience etc etc, they just want dump people who just follow them blindly, so they can mould them according to their wishes. Will these mean that Legal Cheek stops publishing articles foolishly telling their student readers that they need to learn to code, when all potential trainees would be best focusing on getting the best grades they can and doing as much as they can to learn about the industry that they want to work in? This article is telling them that they don’t need to learn to code. And by tech skills, they really only mean that they can use Word, a tiny bit of Excel and sort out the senior partner’s issue with printer toner. Don’t libel communists. Fascists are the ones that censor things. Communists tell the truth, always. Of course. Truth grows out of the barrel of a communist censor’s pen. hey those redlines aren’t going to run themselves. Finally LC article posting an article with some sense. Any trainee or associate in a large firm could have told you that the cited traits are much more important than being tech savvy, learning to code or being ‘commercially aware’.